Core Legato-team member: S Natarajan, Indian Institute of Technology-Madras, India.  it may require complex remeshing to capture topological changes, for instance due to discontinuous surface growth. In polygonal finite elements, the use of elements with more than four sides can provide the flexibility in meshing and the solution accuracy. In polygonal finite element methods (PFEM) have been receiving increasing attention. In PFEM, the domain can be discretized without needing to maintain a particular element topology. This is advantageous in adaptive mesh refinement, where a straightforward subdivision of individual elements usually results in hanging nodes. Conventionally, this is eliminated by introducing additional edges/faces to retain conformity. This can be avoided if we can directly compute the stiffness matrices on polyhedral meshes with hanging nodes. Polygonal/polyhedral elements allow all elements to be treated using a quad-tree/oct-tree mesh within a single paradigm. For example, elements of class (1) quadrilaterals, (2) pentagons and (3) hexagons can be assembled within a single routine. 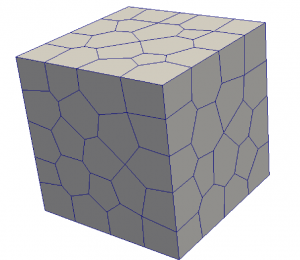 It was observed in that the strain smoothing technique over arbitrary polytopes yield less accurate solution when compared to other techniques, such as the conventional polygonal finite element method. The objective is to extend the strain smoothing technique to arbitrary polygons and polyhedra and to device a stable numerical technique within the framework of strain smoothing technique for arbitrary polygons and polyhedra. S Natarajan, ET Ooi, I Chiong, C Song, Convergence and accuracy of displacement based finite element formulations over arbitrary polygons: Laplace interpolants, strain smoothing and scaled boundary polygon formulation, Finite Elements in Analysis and Design, v85, 101-122, 2014.